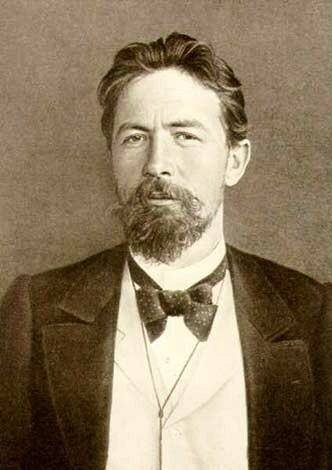 Not only did Chekhov dispense great writing advice, he was a snappy dresser, too. For me, reading this quote made “showing” “click.” Not only does showing make writing far more interesting to read, it’s free of that boring clunkiness — that perceptible weight telling hangs on innocent passages of text that make them drag for the reader. Often these “showing” parts make you swoon and sweep you off your feet. Consider this passage from one of my favorite novels of all-time: The Shipping News by Annie Proulx, a master of showing detail. Grey eyes close together, curly hair the color of oak. The fluorescent light made her as pale as candle wax. Her eyelids gleamed with some dusky unguent. A metallic thread in her rose sweater…While she remained a curious equation that attracted many mathematicians. The dusky unguent, that metallic sweater thread signifying “tacky.” The skin palor that cannotes someone almost unhuman. The curious number of “mathematicians” attracted to her as though she was an equation. All these incredible details paint a clear picture in your mind and these pieces scream: floozie. When you’re working on your writing projects this year — no matter whether you write poetry, fiction, or nonfiction — remember Anton Chekhov’s light glinting off broken glass. Write well! Thanks for sharing this, sometimes I end up confusing myself that ‘show, don’t tell’ is not clunking a boat load of descriptions that make a mess instead of becoming a flow. Oh God, how I love this quote and passage! This is such a good reminder for me. I come from the world of medical/technical writing where the motto is “just the facts, ma’am.” I still think some blogs in my new genre (home, health, lifestyle) are too chatty so I’m really focused on finding MY voice. My blog is about one week old..the posts are primarily practice posts so I can get my arms around the technology. But, moving forward, I will critique every entry…by asking myself….does this show….or tell? Thank you so much for posting this, I have always struggled grasping this concept. That Chekhov quote is one of my favourites too – a perfect lesson in show vs tell. I love it because it’s such a succinct, yet rich reminder. This was very timely to me! Thank you for sharing this. It’s something I need to work on in my writing. One of the best daily posts ever! I am more intrigued by sentences like this “While she remained a curious equation that attracted many mathematicians”. This offers readers a clear view of the wife’s attraction. The words are poetic. Thanks for sharing writing advice. Wish all writers would follow it. More of an Ibsen fan myself (for me, his imagery far surpasses Chekhov’s – then again, Chekhov was his protegé), but otherwise a solid piece of advice! Thank you for this post! Learn something new everyday. That guy in the picture looks like Bud Bundy from the TV show, Married With Children. Yes! Visual! Picture painting! Letting the reader do some work, engage, be part of the conversation, fill in the missing bits in his or her imagination, piecing the clues together. Lovely. Thank you. This is exactly what I set out to learn. I still tell but don’t show 😉 Thanks! The advice I was given through a writing program I enrolled in was a) have someone who knows nothing about the story read it and give feedback. You need to give it to someone who isn’t afraid of telling you the truth though! And/or b) when you’re done writing the story or chapter or whatever it is, walk away from it for a week or longer. Go back to it when you can’t remember it word for word, and take a red pen to it. Add in things that close gaps in the information. You may end up adding in whole scenes to explain why something is the way it is, or why a character response a certain way to the situation they find themself in. Mave enjoyed soft gingerbread over hard. Mave closed her eyes as she munched on the soft gingerbread cookie. Her mind immediately went to her mother’s kitchen and the smell of spices and molasses as her mother set the oven temperature. Sitting on a stool, she had watched her mother’s tireless hands roll out batched of dough, pressing cookie cutter shapes across the covered counter top. All of the was eclipsed as soon as the first batch of gingerbread emerged from the oven. Soft to the touch, softer than any store bough cookie. Her mother’s gingerbread was why she preferred soft to hard. Wish you a very good day! And thanks again! Not a problem! I’m glad you found what I wrote helpful. Photography is an amazing medium to get in to (my sister does photography, I went for words :D). That may be a good way to ‘show, not tell’ too. You take a photo and then use words to not just describe the scene, but show the story of how it came to be. A nice insight into writing just about anything. I’m sure the quote is a breath of fresh air for every writer. Love Chekov’s quote and dressing style 😉 Do you have a good example of “show, don’t tell” in non-fiction? One of my favorite non-fiction pieces is Michael Paterniti’s The Long Fall of One-Eleven Heavy , which recounts the crash of SwissAir 111. There’s an almost poetic reverence Paterniti takes in approaching this disaster, telling the story from several different angles. Have a read and let me know what you think. So true yet so difficult at times. Still struggling to recognize the difference. I know other readers will want to chime in, though for me, showing is taking a less direct path to what it is you’re trying to say. As Chekhov notes, you could simply say the moon is shining, which does allow the reader to paint their own version of the moon shining in their own mind. The glint of light on broken glass is more of an indirect, yet poetic way of getting the same point across: that the moon is out and that it can be seen. I will copy this and put it somewhere on my prick board to always remind me the difference between showing and telling. Others tried to tell me the difference too but I only ended up getting more confused than ever. There are so many information to digest and points to remember. I do appreciate their efforts though and grateful that they took their time to answer my comment. This is the most simplistic version I read so far. Thank you. A great source of inspiration!! Thank you! This is a great example. I have struggled with the show, don’t tell concept until just recently, but I haven’t been writing much since it clicked. I’ve been opting for a bunch of short posts and lists. Excellent examples chosen to demonstrate this point, especially that of Checkov. I’ve been reading quite a bit of Richard Flanagan lately (Booker prize winner) and can barely make progress for the wealth of ‘show not tell’ phrases contained in his novels. Oh yes, just love everything Flanagan has ever written. Reading his new book slowly so I can string it out. I’ve been trying to implement this advice for the longest time. As an aspiring novelist, it’s a very important literary element. I’m not just out to gain followers, I’m out to gain customers. Who will pay me for a jumble of adjectives? So glad I took a minute to read this post. Excellent writing and examples. A few days into January and I was already feeling writer’s block setting in. This has given me the jolt I needed! Last call! The next Blogging 101 class begins Monday.